While you are in college you take more notes than you thought humanly possible. You have to write papers, outlines, and make sure that you document everything in between. Most people want to keep their college notes in case they ever need them in the future. You are more than welcome to store them if you would like, and we do recommend keeping them for a little while after you graduate, but after a while you have no need to keep them around. There are going to be some important points that you want to keep, and with those the best way to keep them is to scan them onto your computer. That way if you ever needed to look into something it will be easy to access as opposed to having to go through boxes of paperwork just to hopefully find what you are looking for. If you do decide to keep all of your notes, there is nothing wrong with that! You just want to make sure that you organize your documents in a way that will make them useful in the future. If you just have all of your paperwork shoved together in a box in storage, they won’t be very beneficial to you if you ever do decide to look something up. If you decide that you don’t want to keep everything, that is alright as well. You might want to look into shredding your documents just in case you have personal information that you don’t want anybody to find. 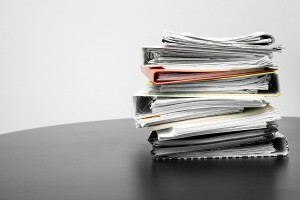 Get Free Quotes on Document Scanning and Shredding Services Today! Transitioning from college to life-after-college can be rough, but Record Nations makes document scanning and document shredding quick and easy. Our professionals have been in the industry for years and know the best techniques for old college notes storage. Call us today at (866) 385-3706 or fill out the form on the right for free quotes on your next project.